The word ‘iconic’ is tossed around very carelessly these days. But no brand of sunglass can lay claim to iconic status like Ray-Ban, creator of the indispensible Aviator sunglass. 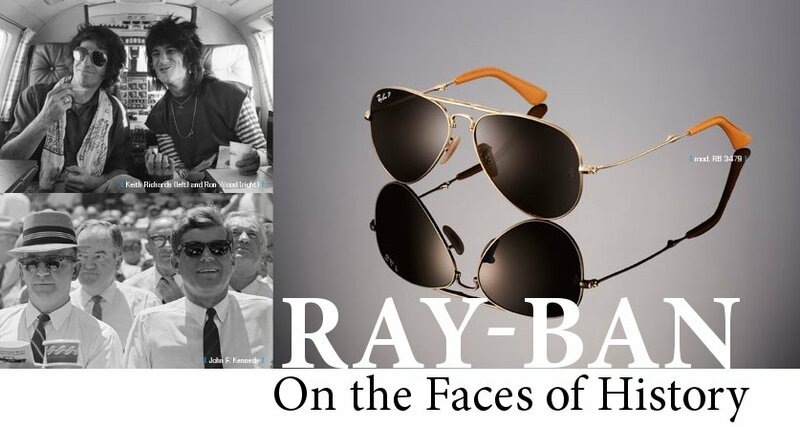 Now a fabulous 75 years old, Ray-Ban is celebrating its milestone birthday by releasing two limited edition anniversary styles, along with a very special limited edition book. Undoubtedly, all culture-watchers will find this a compelling collection. But just try getting your hands on one! As part of the Ray-Ban 75th anniversary campaign, the books will be distributed to VIP clients. Good luck! Obtaining a pair of one of only 7,500 sets of the Ray-Ban Aviator Folding Ultra special edition sunglass may be just as challenging. Luxury knows no bounds with these frames, dipped in 22 carats of white or yellow gold. This is the first folding model in the Ray-Ban Aviator family, with a unique structure that folds at the temple earpieces, along the temples and at the bridge. The temple earpieces and case are bound in genuine leather to commemorate the exclusivity of this release. Another anniversary special release is the Ray-Ban Ambermatic 2012 Limited Edition, a collection of four Aviator-style sunglasses reinterpreted with a famous lens colour from the brand archives. Ambermatic is a special yellow photochromic lens that is responsive to temperature conditions. It transforms from yellow to brown, blocking glare while highlighting shapes, even in the snow. The Ambermatic lens comes in four shapes: Ray-Ban Classic Aviator, Ray-Ban Classic Aviator with curved temple tips, Ray-Ban Shooter and Ray-Ban Outdoorsman. The Ambermatic collection has selective distribution of 16,000 worldwide. Luxottica Group, owner of the Ray-Ban brand, has done a stellar job of celebrating Ray-Ban’s 75th anniversary. The campaign, Never Hide, was awarded two Gold Lion awards at the Cannes Lions International Festival of Creativity in June 2012. Envision: seeing beyond magazine congratulates the creative team behind this celebratory, historic campaign!